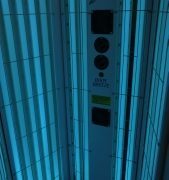 Here at MBS Much Better Skin, we offer a selection of products that use UVB narrowband light to treat a number of conditions (psoriasis, vitiligo, eczema and a few other skin conditions that react positively to UVB light therapy). Today we’re going to turn our attention to the two smaller pieces of equipment: the mini units and handheld units. In general, the UVB lamps in all our units release a spectrum of ultraviolet light, which tends to have a range of wavelengths between 290-320 nanometres. 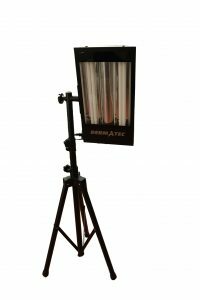 This light is mainly concentrated around 311nm recognised, by scientists, as the therapeutic wavelength to treat skin conditions such as psoriasis, lichen planus and atopic dermatitis (eczema), vitiligo (loss of skin colour) and some other skin diseases. These handheld and mini units are specifically designed to treat small patches of skin, such as the hands, scalp, elbows, knees, and so on. It is important to note that these devices are not suitable for those who suffer from a skin condition across the whole body, as our full body units and canopies are designed for this purpose. However, both these smaller units are ideal to treat small patches of affected areas. 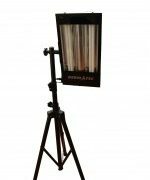 This mini unit uses two 36w Philips PL01 narrowband tubes and comes supplied with a swivel stand, so that you can adjust the angles. This enables you to use it standing up, over a chair, or, in some cases, over a bed. This unit is suitable for use on small patches, for example, on your legs or arms. It has a 4-minute timer to help you treat yourself, and it also features a total usage counter. It is easy to set up and take down, and can easily be stored in a cupboard. The light face is around 22 inches, and the light emitted has a wavelength primarily around the 311 nanometres. A full instruction booklet is provided. The handheld unit is fitted with one 9w Philips PL01 narrowband tube, and is supplied with a removable comb attachment, plug adaptor, timer, goggles and instruction booklet. The Philips PL01 Narrowband Tube has a wavelength of around 311 nanometres. The handheld unit is particularly useful for tackling small patches and areas on the scalp. It is supplied with a solid UPVC plastic case, so you can easily store it, and even carry it in case you go away. Both of these units come with a 12-month warranty, and the mini unit is also available with 0% finance. We can also offer those suffering from chronic skin conditions with a VAT exemption (VAT exempted price shown on the website). This might be you if your condition is constant, or if it is something that comes back frequently. Obviously, the Mini unit with its two 36w bulbs is more powerful than the handheld unit but as mentioned before, if you have patches all over the body or larger patches then you need to consider our larger and more powerful canopies and cabinets. To find out more about our mini units and handheld units, please don’t hesitate to get in touch with us by filling out our contact form, or by emailing us at sales@treatpsoriasistl01uvblamps.co.uk. From our contact page, you will also find a range of phone numbers in order to speak to a member of the team directly. We will be pleased to answer any questions you may have for us.